Welcome to Day 97 of 100 Days of Disney here on The Purple Pumpkin Blog! Be sure to check out all of the other posts in this series, and if you would like to share your own Disney blog posts or pictures, make sure you check out our #100DaysOfDisney Link Party! It’s the final Saturday during #100DaysOfDisney so it’s time for Saturday Night At The Disney Movies! 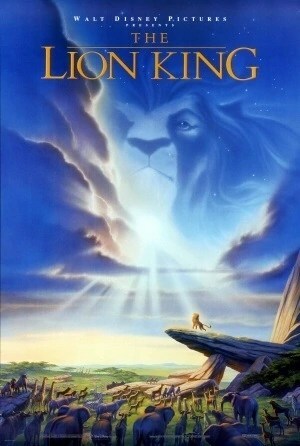 I’ve saved the best for last – The Lion King, which I think is a Disney movie of epic proportions! It would be easier for me to say what I don’t like about this film, that what I do. Things I don’t like: nothing; things I like: everything! In the Pride Lands of Africa, the animals are ruled over by King Mufasa, a lion and his wife, Queen Sarabi. 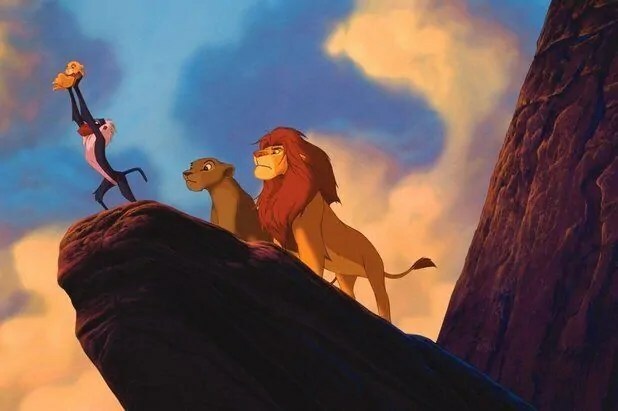 They have a son called Simba, who is the envy of his uncle Scar (Mufasa’s brother) as the cub’s birth means he is now first in line to the throne. 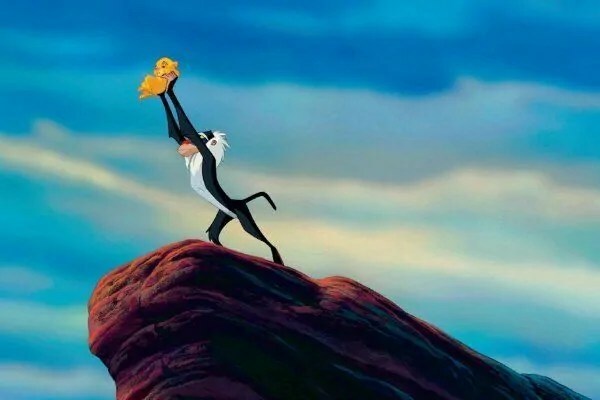 As Simba grows, his father takes him on a tour of his domain and teaches him about the responsibilities of being king and about the circle of life. Later that day, Simba tricks his friend, a lioness cub called Nala to explore the forbidden elephant graveyard, despite the protests of Zazu, Mufasa’s majordomo. 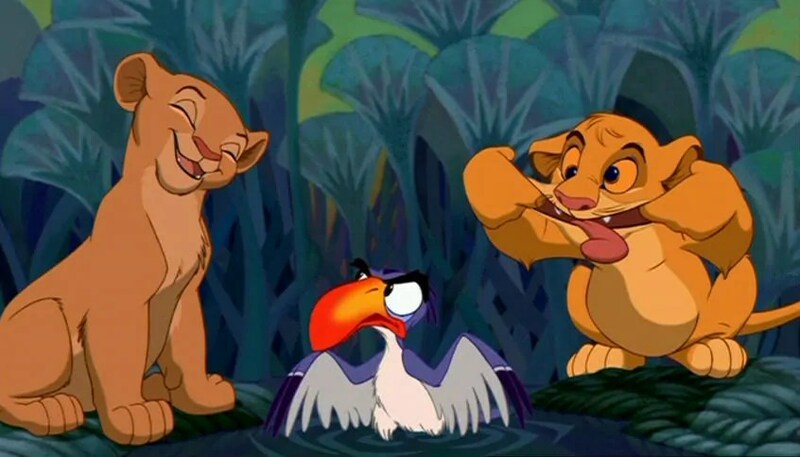 While in the graveyard, the two young lions are attacked by hyenas – Shenzi, Banzai and Ed, before Mufasa, alerted by Zazu, rescues them and forgives Simba for his actions. That night, the hyenas, who are allied with Scar, plot with him to kill Mufasa and Simba. The next day hyenas stampede a large herd of wildebeest into the gorge where Scar has lured Simba. Mufasa rescues Simba, but as Mufasa tries to climb up the gorge’s walls, Scar throws him back into the stampede, where he is trampled to death. Simba is convinced by Scar that he was responsible for his father’s death and tells him to flee the kingdom. As Simba runs off, Scar orders the hyenas to kill the cub, but Simba escapes. 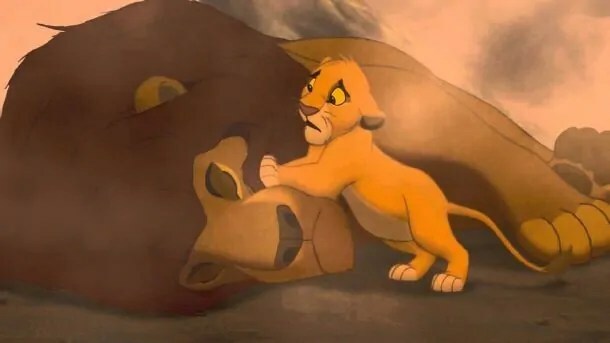 Scar announces to the other lions that both Mufasa and Simba were killed in the stampede and steps forward as the new king, allowing a pack of hyenas to live in the Pride Lands. 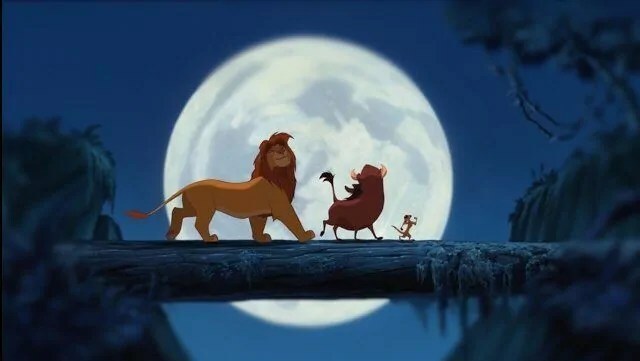 After running far away, Simba meets Timon and Pumbaa, a meerkat and a warthog, and grows up with them in the jungle, living a carefree life with his friends under the motto “hakuna matata” (it means “no worries”). A young adult Simba rescues Timon and Pumbaa from a hungry lioness, who turns out to be Nala. She and Simba reconcile and fall in love. Nala tells him that Scar and the hyenas are destroying the Pride Lands with not enough food and water, and encourages him to return home. Simba refuses, still feeling guilty over his father’s death. As Simba enters the jungle, he encounters Mufasa’s mandrill friend and advisor, Rafiki. 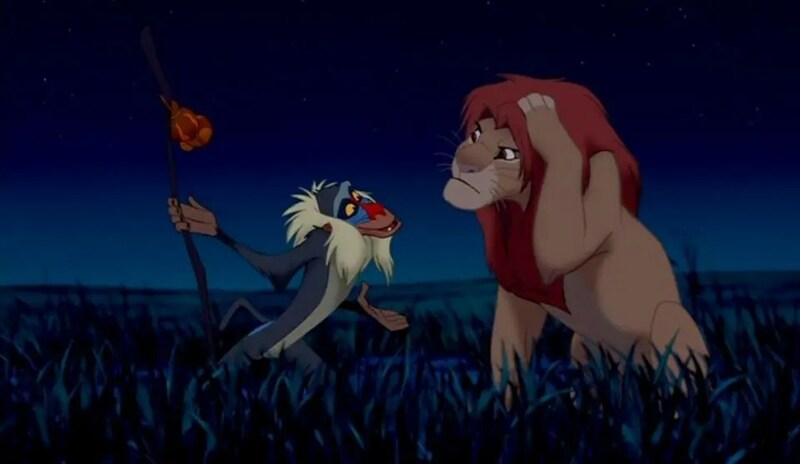 Rafiki tells Simba that Mufasa is “alive” and takes him to a pond. There, Simba is visited by the ghost of Mufasa in the sky, who tells him he must take his rightful place as the king of the Pride Lands. Simba realizes he can no longer run from his past and goes home. Nala, Timon, and Pumbaa join him, and agree to help him fight. At the Pride Lands, Simba confronts Scar, who taunts Simba over his “part” in Mufasa’s death. But when Scar pushes Simba to the edge of Pride Rock, he admits he himself killed Mufasa. Simba roars back up and forces Scar to reveal the truth to the other lions. Scar, attempts to escape, but is cornered by Simba at the top of Pride Rock. 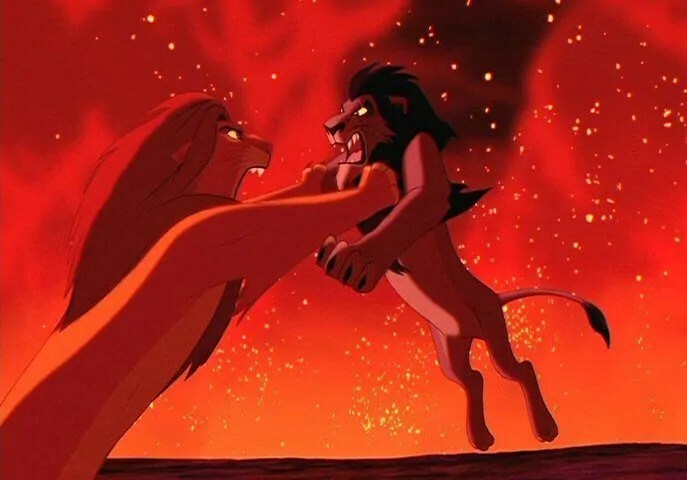 Scar begs Simba for mercy, saying he is family and placing the blame on the hyenas. Simba says he does not believe Scar anymore, but spares his life and commands him to leave the Pride Lands forever. Scar meekly walks past him, but then attacks his nephew. After a fierce battle, Simba throws his uncle off Pride Rock. Scar survives the fall, but is attacked and killed by the hyenas, who overheard his attempt to betray them. With Scar and the hyenas gone, Simba ascends to the top of Pride Rock and takes over the kingdom as the rain falls again. Sometime later, with Pride Rock restored to its former glory, Simba looks down happily at his kingdom with Nala, Timon, and Pumbaa by his side; Rafiki presents Simba and Nala’s newborn cub to the inhabitants of the Pride Lands and the “circle of life” continues. premiered at the famed Radio City Music Hall in New York City. lead to many derived works, such as a Broadway adaptation, two direct-to-video follow-ups – sequel The Lion King II: Simba’s Pride (1998) and the prequel/parallel The Lion King 1½ (2004) — and two spin-off series Timon and Pumbaa and The Lion Guard. The opening scene – (above) is, I think, the best opening scene of any animated movie. Ever. From the first moment I hear the African chant, to the drum beat of the final moment, I’m swept away with such emotion, and I cry, every single time I hear The Circle of Life. Hakuna Matata – (below) is a song we should all learn and sing. Regularly! It means no worries doncha know! Plus, it’s a great growing up montage song! Timon & Pumbaa – I love these guys – they’re so funny! The animation – it’s hand drawn, it’s classic, it’s beautiful! The blooper reel! – seriously, I have JUST discovered this, it says it’s from The Lion King 3D which was released in 2011, and it’s hilarious! But then, I do love a blooper reel! 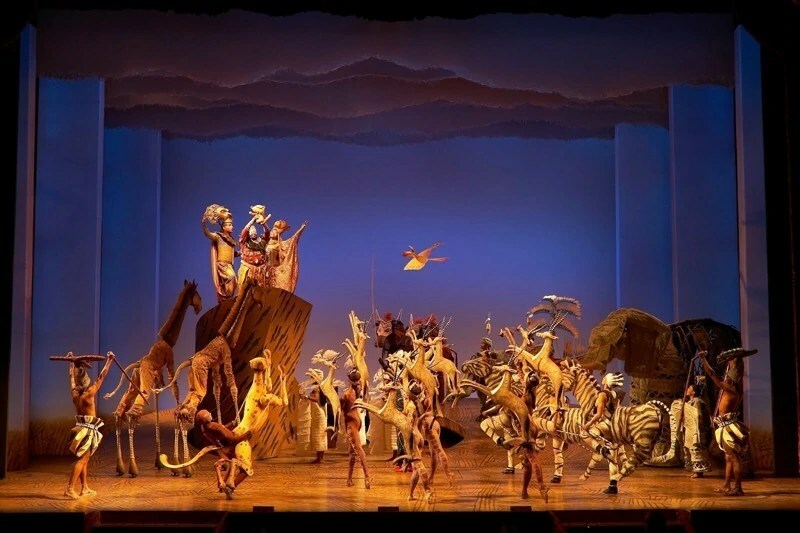 The stage show – I’ve seen this at the theatre in London, as well as the Festival of the Lion King at Animal Kingdom, Walt Disney World, and they’re just as awesome as the film. The theatre show in London especially – I lost it (emotionally) from the minute the music started, and was sat next to someone who was equally emotional and we hugged and cried together – both pleased that we were not the only ones!! I hope that you enjoyed reading about one of my favourite Disney movies! Day 97 of #100DaysOfDisney is done – 3 to go!